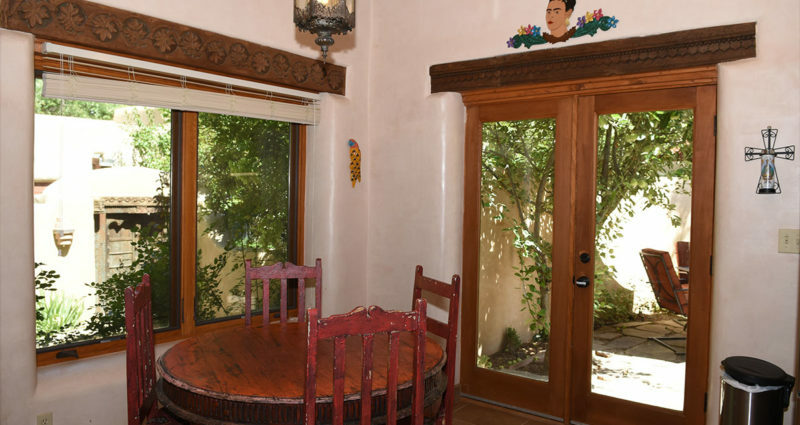 If you’re a group of one to four people looking for the quintessential vacation accommodations in Taos, Taos Villas #3 may just be the perfect choice for you! The spacious floor plan of the two-story, two bedroom / two bath Taos Villa Number 3 offers you plenty of personal space, yet ample opportunities to gather in a cozy setting. The two bedrooms can accommodate up to 4 guests. In the grand living room, the seating areas are fluid, so you can position the leather sofa, two armchairs, two benches, coffee table, end tables and conversation table in a myriad of arrangements to allow you to engage in whatever activities you wish: watching the large screen TV, nestling near the fireplace (wood is provided! ), gathering to play cards or board games, or just gazing out the enormous windows at the beautiful scenery just outside. A ceiling fan provides circulating air in this high-ceilinged great room. The kitchen in Taos Villa 3 is very well equipped, probably more so than one would expect in a vacation rental property in Taos. Large appliances include a stainless steel refrigerator, a gas oven and four-burner stove, and a dishwasher. Smaller appliances include a microwave and a wine fridge. A drip coffee maker, toaster, blender, and numerous other cooking gadgets and appliances round out the kitchen essentials. You’ll find plenty of glassware, dishware, serving pieces and utensils to serve the delicious recipes you create in your kitchen away from home. The four-person dining table sits alongside two walls of large windows, essentially giving you a feeling of dining al fresco. Two benches can be brought in from the living room to accommodate additional guests at the table if necessary. 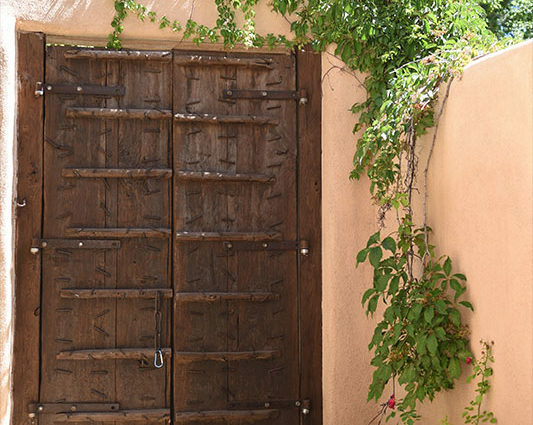 For a Taos vacation rental, we believe that having outdoor areas to gather is a necessity. Villa 3 has multiple outdoor areas, each unique and private. The larger of the private, walled ground-floor patios is accessed through the dining room, and includes a dining table and four chairs (although two additional chairs may be brought from the other patio to accommodate six at the table). A center umbrella in the dining table provides shade if desired. On the smaller of the walled, private ground-floor patios (accessed through French doors in the living room), you will find a table with two chairs (the ones that can be brought through to the other patio), as well as the propane gas grill. We feel that having this outdoor grilling option at your vacation rental in Taos sets the Taos Villas apart from many other accommodations in Taos you might consider. We provide you with propane and grilling tools so you can enjoy the experience. An open staircase with expansive windows leads to the upstairs Master suite. The very sizable Master bedroom includes a King bed and two sitting chairs, as well as a bench, bedside tables and lamps. A chest of drawers, and the generous walk-in closet provide more than ample storage. The en suite Master bath boasts a Jacuzzi tub and a separate shower, as well as rich architectural detailing. There is direct access to two covered outdoor decks from the Master suite. One of the decks boasts a kiva fireplace, two chairs and a table… perfect for relaxing with a morning coffee or an evening nightcap. The second bedroom is located on the ground floor, and features two double beds, bedside table and lamp, plus a bench and floor lamp, and the closet is roomy. You can access one of Villa 3’s private, walled courtyards directly from this second bedroom. There is a second full-size bathroom with walk-in shower located on the ground floor. Also located on the ground floor, tucked under the open staircase, is a stacked washer and dryer set, with a bit of detergent provided. We also provide an iron and ironing board (though we hope you won’t need to resort to ironing during your Taos vacation!). A one-car garage and an additional assigned parking space provide parking for two vehicles at the Taos Villas property. Should you wish to bring an additional vehicle we will try our best to accommodate it on the property, however even if we are unable to do so there is free parking available in a nearby lot, for vehicles in excess of two. 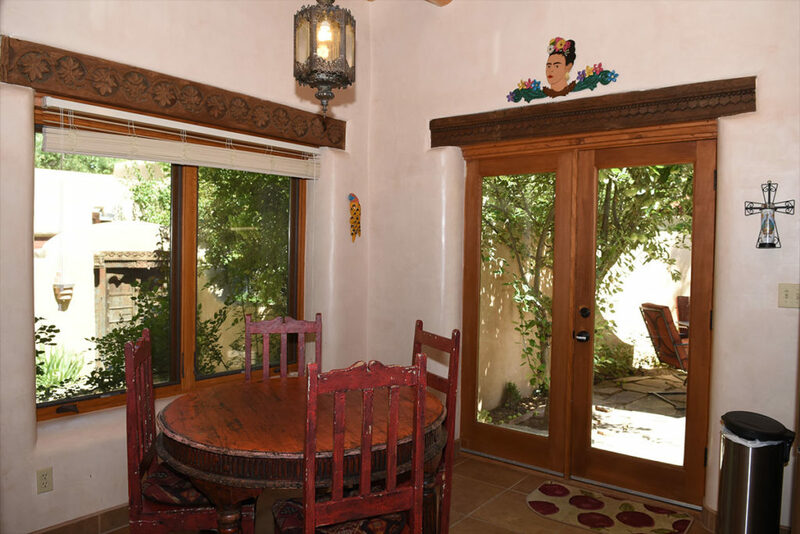 We feel it’s important for guests to know what to expect from their Taos vacation rental property, in advance of arrival. We’re confident that you will find Taos Villa 3 to be a comfortably furnished, well equipped “home away from home” …. 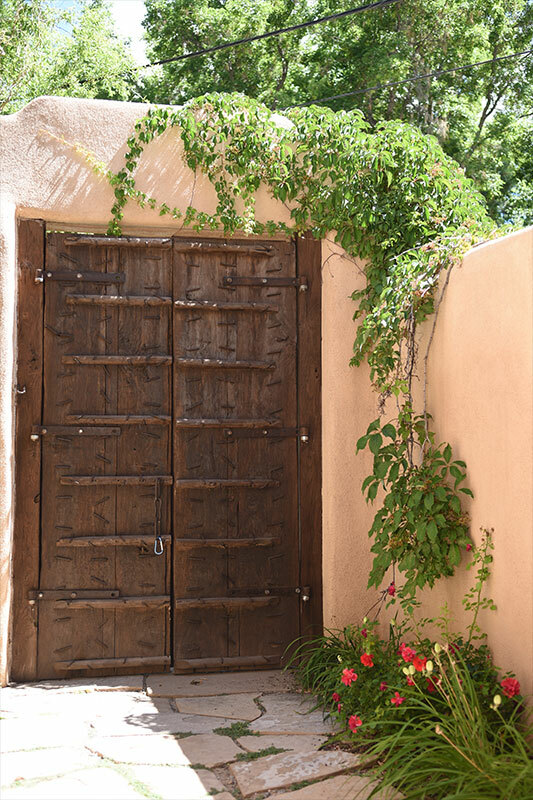 in an incredibly desirable location….for your Taos accommodations. Copyright 2015-2017 by Taos Villas. All Rights Reserved.